Georgia woman charged with murder for taking abortion pill. 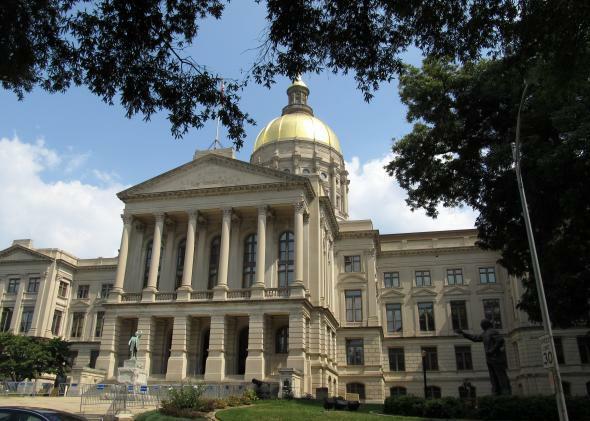 The Georgia capitol, where legislators have enacted myriad strict abortion laws. Update, June 10, 11:30 AM: The prosecutor has dropped the murder charge against Jones. On Saturday night, Kenlissia Jones begged her neighbor to drive her to the hospital. Jones, a 23-year-old mother of a young son, had taken Cytotec, an abortion pill she procured online. But Cytotec is only safe in the first trimester of pregnancy, and Jones was over five months pregnant. She delivered the fetus in the car, and it died after half an hour in the hospital. Jones was promptly charged with malice murder. The crime is punishable by death or life imprisonment. Jones is not the first woman to be prosecuted for attempting to abort her own fetus. I recently wrote about Jennie Linn McCormack, an Idaho woman who, like Jones, took abortion pills in her second trimester, and was later arrested for it. (McCormack wound up suing Idaho and knocking down its anti-abortion laws in court.) The details of these cases are tragic and grisly, causing both pro-choice and anti-abortion groups to shy away from them. On the pro-choice side, no one wants to celebrate a doomed 5-month-old fetus delivered in a car. On the anti-abortion side, few are willing to concede they believe women like Jones and McCormack should be prosecuted. As I explained in my McCormack article, anti-abortion activists generally insist that the law should protect women by prosecuting only abortion providers. But the law didn’t protect Jones or McCormack. It sent them to jail. By restricting access to abortion clinics and honest counseling, the draconian abortion laws enacted in states like Georgia push women like Jones to terrible extremes. Rather than locate a clinic willing to perform her abortion—which would probably have been illegal under Georgia law—Jones bought a pill online. Rather than obtain a safe medical abortion, she took a dangerous gamble, and—after a period of intense pain—delivered a fetus in a car. Her story doesn’t fit neatly into the pro-choice or pro-life narrative. It’s simply an illustration of what happens when a desperate woman takes her abortion into her own hands. Jones is currently being held in jail without bond. Her case will soon go to a grand jury.